Wow, this movie was a LOT of fun to watch! They even made a comic book about it (ahh…watch where you’re pointing that rifle, John….). 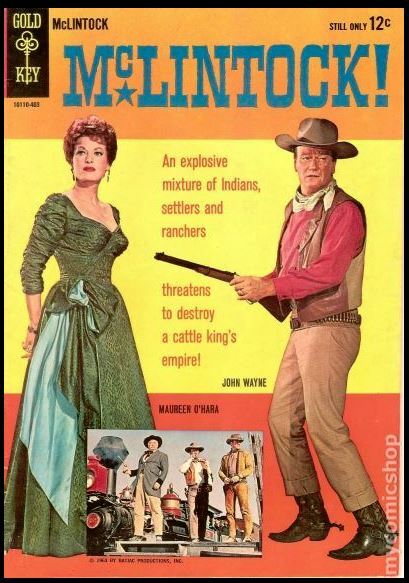 Yes sir, John Wayne (as George Washington “G.W.” McLintock) and Maureen O’Hara (as Katherine Gihooley McLintock) were just part of this star-studded Western donnybrook filmed in glorious Technicolor and Panavision. We are also treated to three separate scenes featuring Virginia & Truckee #22 4-4-0 Inyo which was owned by Paramount Studios at the time. Let’s jump right in with both feet and enjoy this comedy oater from back when Hollywood still knew how to make an entertaining picture. With spankings. Here disguised as Southern Pacific #9, Inyo pulls a mixed train (passenger and freight) beneath a tremendous plume of smoke. That’s good welded rail underneath V&T #22, not something you’d find in the 1890’s. Nice shot of the McLintock depot in Southern Pacific weathered yellow/brown. The station sign reads, “6,000 feet above sea level”. Hey, there’s Uncle Joe from Petticoat Junction! Man….Edgar Buchanan sure seems to appear in a lot of my reviews. Here he plays the local prospector/layabout/curmudgeon “Bunny Dull”. Nicely framed by cactus and lower-quadrant semaphores set at “proceed”, John Wayne heads over to the nearby stockyard. As the Inyo rolls up in the background, G.W. talks over the price of moo-moo cows he’s going to ship East. Big Macs on the hoof! G.W.’s sidekick Drago (played by Chill Wills) prepares to fire his revolver skyward to get everyone’s attention for John Wayne’s little speech from the loading chute. Behind is a decent view of the nose of V&T #22. Close up of John/G.W. reveals the freight train behind him. As the short train leaves town, we get our best view of the elaborate script “Southern Pacific” on the tender — as well as Inyo’s cab and trailing freight cars. That’s John Wayne’s son Patrick Wayne (as Devlin “Dev” Warren) trackside with Uncle Joe/Bunny. Is it cold in here? The battling McLintocks discuss lovely daughter’s imminent return. Louise Warren (played by Yvonne De Carlo rahr-RAHR!) has it out with Kate. Aaaaaand just for the sake of feminine pultritude, I include these two vistas of assorted dance hall girls and G.W./Kate during the infamous mud hole scene. No trains, but top notch scenery. Sure enough, the townsfolk have turned out at the station as SP #9 hauls Becky McLintock homeward from college. There’s even a brass band on hand as we get a good look at Southern Pacific coaches 4 & 5. Becky (played by a very young Stefanie Powers, hubba-hubba!) greets Mom & Dad. I like the fancy painted-to-match-the-coaches step box next to the conductor between cars 4 & 5. Also on the train are a box car full of Indian Chiefs! That’s Chief Puma (played by Michael Pate), G.W.’s old adversary having a chat trackside. Two more general views of rolling stock: V&T 22 as SP 9 and a low light view of the rear of the train — note the short siding or set out track which will figure prominently in the final train scene. The movie’s finale begins as an SP box car full of rifles and ammo is mysteriously opened. Why, it’s smelly old Bunny Dull! What’s he up to? Under “unofficial” orders from Boss G.W., the local Indians are given horses to ride and weapons to hunt with. A train load of U.S. Cavalry is racing towards town to put the Indians onto a reservation — but they’re a little too late as the tribe makes their escape. Note the station order board is now set at stop. This ends the train scenes and my review. Oh…..the spankings? Let me see here…..
Like father, like son. G.W. appreciates the cut of Dev’s jib and grants his permission to marry feisty daughter Rebecca. But not before Dev administers a little frontier justice. Towards the end of the picture, G.W. finds himself also smacking wildcat wifey’s bottom. The punishment works and G.W. and Kate live happily ever after. One more view of the dynamic duo consummating their wedding vows as Becky & Dev look on. GREAT shot of the lovely Maureen O’Hara (yowza!). I just love a happy ending. This is one of the better Obscure Train Movies I’ve reviewed in quite a while. It was a pleasure to actually visit Virginia & Truckee #22 in Carson City, Nevada and ride in the cab last June (2018). This entry was posted in Uncategorized and tagged Batjac Productions, Edgar Buchanan, John Wayne, Maureen O'Hara, McLintock! 1963, Michael Pate, Panavision, Paramount Pictures, Patrick Wayne, semaphores, Southern Pacific Railroad, Stephanie Powers, Technicolor, United Artists, V&T #22 The Inyo, Virginia & Truckee, Yvonne De Carlo. Bookmark the permalink. The cartoonist is just pointing out the facts of life to see if the kiddies are paying attention.